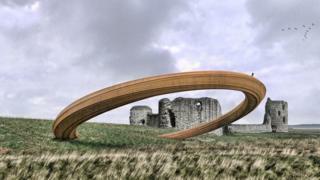 Scrapping plans for an "insulting" iron ring sculpture at Flint Castle have left people living in the town "up in arms", its mayor has claimed. The Welsh Government halted the plans following a petition and accusations decision-makers were ignorant and disconnected from people's views. It was claimed the ring symbolised the oppression of Welsh people. But Vicky Perfect said history could not be changed and claimed most of the opponents were from south Wales. Flint was one of the first castles to be built in Wales by Edward I - construction began in 1277. "You can't change history and this castle has stood for 740 years - the start of the iron ring," she said. "I'm Welsh and I don't feel insulted that we were going to have it." However, work on the castle will continue, potentially including an alternative art installation. "They're [residents] up in arms about not having it. The locals who actually live here were looking forward to it because they thought it would be a really good plus not only for the castle but the town in general," Mrs Perfect added. "Ninety per cent of the people who signed the petition saying they didn't want the iron ring in Flint have never visited the castle, never likely to visit the castle and most of them are from south Wales. "I was devastated to be honest."